Like many Triangle residents, I moved here from up north. My dad, who has the perfect Ohio lawn, asked why everyone here kept lawns “long”. He was used to the Kentucky bluegrass and fine fescue mix common in his area. Our tall fescue looked – well, so TALL. In fact, my lawn wasn’t too long. I had checked Extension guidelines for our lawn and we were cutting to the recommended height (3 – 3.5 inches). Tall fescue is well suited for the conditions in Durham, but it is not a compact grass. This grass has a bunching habit and will look patchy if it is cut too short. Patchy lawns have more space for weeds to grow, so a thicker, longer lawn will be less weedy. Fescue mowed at the proper height tends to have deeper roots. A healthy root system helps the grass be more efficient at getting water and nutrients from the soil, potentially reducing the need for irrigation and fertilizer. Tall fescue shouldn’t be allowed to get TOO tall, though. 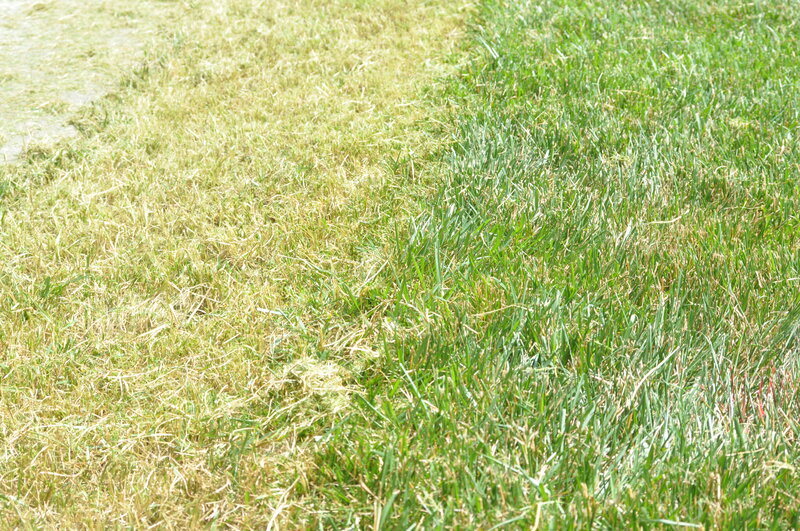 Lawns should be cut before they reach 5″, and should be mowed frequently enough that less than 1/3 of the length is cut. Unless you’ve waited too long to mow or have mowed when grass isn’t dry (two lawn maintenance don’ts), there is no need to bag the clippings. 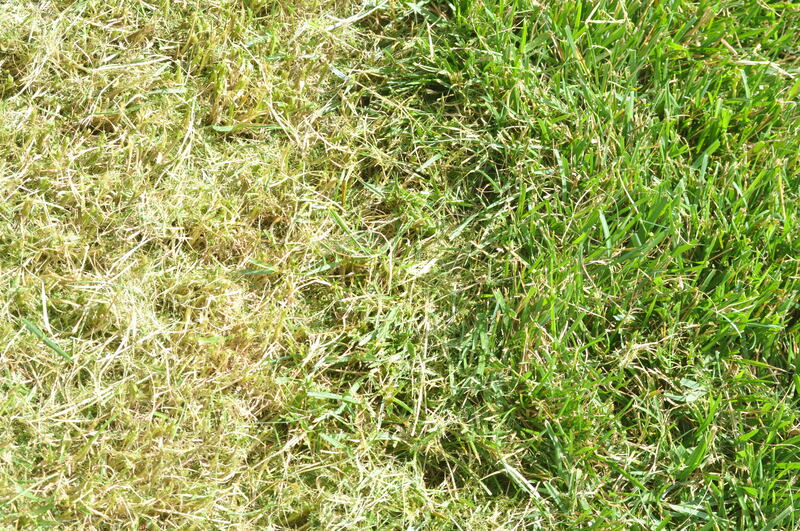 Grass clippings decompose quickly and provide nutrients, and they don’t cause thatch. As a demonstration of proper vs. improper cutting height in a tall fescue lawn, I asked my husband to cut a section of our lawn at the lowest setting (don’t worry, the damaged fescue is in an area that was slated to become a landscape bed). After one cutting at the improper height, the fescue is noticeably stressed. This low mowing removed more than 1/3 of the length of the blades of grass – it removed almost all the healthy green blades! After two weeks of mowing this way, nearly all the tall fescue in the “too low” section was dead. The only green left was courtesy of some grassy weeds that took advantage of the space. After a little weeding and some mulch, though, this spot is now ready for cooler weather, when I’ll add some lower maintenance plants. The remaining fescue lawn is tall, green, and healthy – and is probably ready to be mowed again tomorrow.